Gas prices continued to fall during the past week as many summer vacations began to wind down in the face of a new school year. The weekly survey from the U.S. Energy Information Administration shows the average price of a gallon of regular unleaded fell by another two cents during the past week. That brings the average cost of a gallon of gas down to $3.52, which is the lowest prices have been since the beginning of March. Many areas enjoyed an even stronger price dip, however, as summer demand for fuel wanes. Along the Gulf Coast region, the price of gas went down by as much as a nickel per gallon, in some spots, according to spotters for TurnpikeInfo.com. The official E.I.A. survey shows the region enjoyed a price drop just over four cents per gallon, bringing the regional average to only $3.31. That price point is the lowest in the nation. 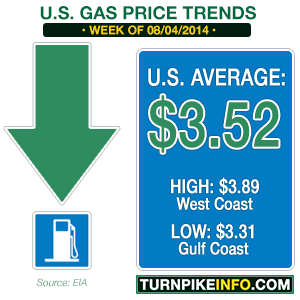 Even those areas that have significantly higher prices than the Gulf Region caught a break at the pump this week. Along the West Coast, where prices have remained well north of $4.00 for most of the year, the average price of gas is now down to $3.79 per gallon. However, when California is added into the mix, the West Coast regional average shoots up to $3.89 per gallon, according to the E.I.A. survey. California, alone, is still confronting gas prices near the $4.00 mark, with an official price point of $3.95 per gallon. In San Francisco, regular unleaded is still be purveyed at $4.00 per gallon or higher. For drivers across the East Coast of the U.S., the price of fuel ranges anywhere from $3.41 along the Lower Atlantic region to a high of $3.65 in New England, at least as far as the official government numbers go. Of course, many urban drivers are finding themselves paying much more than their regional averages. Drivers traveling many interstate highways and toll roads are also paying a bit more for their gas, although that is not the case in New Jersey, where the state regulates gas prices at the service plazas. Midwestern drivers are paying about a penny more this week than last, according to the latest government figures. Drivers in that region, which has suffered extraordinary price volatility in recent months, are paying an average $3.42 per gallon this week, up from about $3.41 last week. Ohio, where prices have been on a pendulum swing for weeks, suffered a nearly 11¢ hike in prices during the past week, nearly erasing pricing gains enjoyed just a few days ago. A gallon of gas in the Buckeye state averaged $3.49 on July 21, then $3.36 on July 28, only to return to $3.47 per gallon during the past week. Overall, however, prices nationwide are expected to continue declining or, at the very worst, leveling off as seasonal travel winds down. Many school districts across the country are already gearing up for classes, and in some areas the first quarters start this week.